“The Polisario has just found itself a role as an actor in the control and the administration of migratory fluxes, while some credible international reports and different witnesses have confirmed that the Front has deployed all kinds of trafficking,” said Taib Fassi Fihri. The Moroccan Minister denounced the use of the buffer zone for political ends and drew attention to the importance of constructing brotherly relations between Morocco and the African countries. The phenomenon, according to the Minister, has no relation with the regional conflict. “Morocco is the first victim of this migratory phenomenon. The country sees the flow of thousands of Africans, administered by mafia and criminal networks, leave their homeland and pursue the European dream,” he underlined. The Minister also recalled Morocco's permanent appeals to Algeria, through regional organizations, the European Union and many member states, to adopt a less permissive policy concerning illegal migration and to control its borders. He stressed that such cooperation is necessary for the development of the continent. “It is an objective to which Europe must contribute in its attempt to stop the causes of migration,” he said. “The Polisario is a mafia group which takes advantage of illegal migration and exploits the issue to serve its wicked plans,” he emphasized. The minister also declared that so far over 2,500 sub-Saharan migrants have been repatriated by plane, affirming that they were not subjected to any violence, either when they were assembled during the repatriation operation. Fihri has denied accusations that Morocco has dumped sub-Saharan African migrants in the Sahara desert. The Polisario claimed earlier it had taken in more than 90 Africans wandering in the desert after Morocco expelled them. 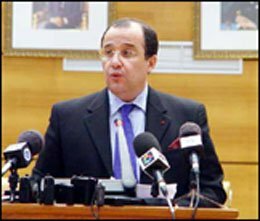 Fihri said the allegations were propaganda orchestrated by the Polisario Front and its ally, Algeria.